After years of extremely accommodative monetary policy, investors in the Eurozone should ready themselves for an eventual increase in interest rates. 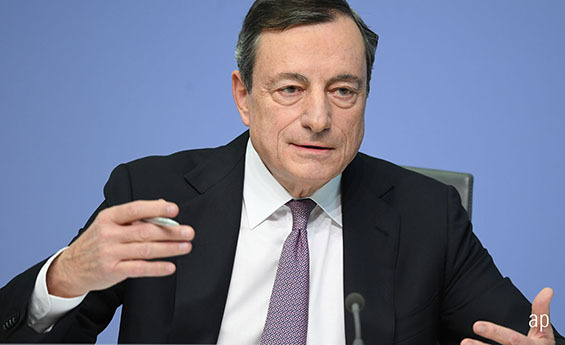 The European Central Bank (ECB) has slashed the monthly amount of bond purchases twice already over the past year, and at the March 2018 policy meeting it dropped the pledge of increasing purchases if needed, as it no longer fitted in with the more optimistic economic outlook. Interest rates will be kept on hold until after the expiration of the programme of asset purchases, which, barring an unlikely extension, takes place in September 2018. After that, further removal of the easing bias will have to come via higher interest rates. This will have consequences for EUR-denominated fixed income holdings. Higher interest rates push the price of existing bonds down. Typically, bond price moves precede policy decisions, as market participants price in expectations well in advance. There are several ways in which investors can steer the fixed income allocation in an investment portfolio to a scenario of higher interest rates. Duration measures the sensitivity of fixed income assets to changes in interest rates; indicating the approximate change in the price of a bond in response to a 1% change in interest rates. There are several ways of calculating duration; effective duration, modified duration, Macaulay duration. However, differences between them are minimal and should not detract us from the basic notion that bond prices and interest rates have an inverse relationship. So, if the average duration of bond holdings in a portfolio is eight years, and interest rates rise by 1%, then we should expect an 8% fall on average in bond prices. Given this inverse relationship, some investors tweak duration in response to expected changes in interest rates. Shortening duration at times of rising rates cushions the downside to bond prices, while lengthening it at times of falling rates enhances the upside. ETFs are handy tools to roll out these strategies. There are plenty of low-cost ETFs tracking indices that measure the performance of delimited maturity segments of government and corporate bond markets, for example, 0-1 or 1-3 years. These ETFs can be used to tilt the duration of a portfolio with precision. Assume a €10,000 holding in an all-maturity eurozone government bond ETF. For example, the iShares Core EUR Government Bond, Lyxor EuroMTS All-Maturity Investment Grade and the Xtrackers Eurozone Government Bond ETFs – all carrying a Morningstar Analyst of Gold – track indices with an average duration of 7.5 years as of this review. By reallocating €5,000 to an ETF providing exposure to the 1-3-year maturity bracket – for example, iShares EUR Government 1-3y, Lyxor EuroMTS 1-3y or Xtrackers Eurozone Government Bond 1-3y, with an average duration of 1.8 years – the overall duration would go down to 4.65 years, thus reducing the downside to bond prices by almost 3% in the event of a 1% increase in rates while maintaining the diversifying benefits of a fixed income allocation in an investment portfolio. Maturity-segmented ETFs allow for multiple duration combinations to suit specific risk and return objectives. However, we must emphasize that engaging in duration management strategies calls for close monitoring of economic developments and a good understanding of how they ultimately drive monetary policy decisions; not just in terms of direction – that is, will rates go up or down – but also the extent and timing of the decisions. Despite the enhanced transparency in central bank communications, timing changes in interest rates – in fact, timing anything related to financial markets – is fraught with difficulties. Some fixed income investors shudder at the mere thought of rising interest rates but still want to enjoy the potential benefits of higher yields. Investors wishing to eliminate interest rate risk can consider floating rate notes (FRNs) or bond funds with an in-built interest rate hedge. Both are available in ETF wrapper. Floating rate notes (FRNs) are bonds with a variable coupon linked to a standard money market rate plus a fixed spread. The coupon adjusts periodically to changes in interest rates. As a result, FRNs have a duration of close to zero, and thus leave investors solely exposed to the credit risk of the issuing entities. Logically, the demand for FRNs goes up at times of rising interest rates. FRNs are mostly issued by corporations. In Europe, the main issuers are financial institutions. As of this review, there are two ETFs offering exposure to the EUR-denominated investment-grade-rated FRN market, namely the Lyxor Barclays Floating Rate EUR 0-7y and the Amundi Floating Rate Euro Corporate 1-3y. Both use synthetic replication. The Lyxor ETF tracks an index that covers bonds with maturity of up to seven years while the Amundi ETF focuses on the 1-3y maturity bracket. In addition to maturity exposure, other differences in construction between the two benchmarks typically translate into higher exposure to credit risk – and thus higher yield potential – for the Lyxor ETF. FRNs are not to everybody’s taste, and so investors wishing to hedge out interest risk while maintaining exposure to the market of investment-grade fixed-rate corporate bonds can opt for the iShares Euro Corporate Bond Interest Rate Hedged ETF. The ETF tracks an index that provides ample coverage of the asset class, with a rough 50/50 split between financial and non-financial issuers. The hedge – a short position in German bund futures – works in such way as to deliver close to zero duration. At face value, this may not sound as much of a strategy. However, investors who use bonds merely as counterweight, that is, as an insurance policy, to equity volatility rather than as a key driver of returns, probably should not pay much attention to variations in interest rates. For that type of investor, a one-stop-shop, broad-maturity, low-cost, aggregate bond passive fund such as the iShares EUR Aggregate Bond ETF or the SPDR EUR Aggregate Bond ETF might be appealing. This is the ultimate “buy and forget about it” type of product that would free you to focus all your energies on the equity part of the portfolio if that is what you wish to do. Both ETFs track the Bloomberg Barclays Euro Aggregate Bond Index. It provides ample coverage of the sovereign, quasi-government, corporate, and covered bond markets denominated in Euro and with an investment-grade rating. The index provides a balanced distribution across the maturity and investment-grade-rated credit spectrum. The improving economic outlook in the Eurozone makes the prospect of rising interest rates increasingly likely. While the expectation is for the first hike to come in the very late part of 2018 at the earliest, financial markets will start to price in the event well in advance. This has important implications for fixed income holdings and requires investors to think about what strategy better fits their risk tolerance and investment objectives. Whether you want to tweak duration, gain exposure to FRNs or simply hold a one-stop aggregate bond solution, you are likely to find a low-cost fixed income ETF to help you achieve your goal.